Anyone who thinks sandwiches are dull needs to pay Farrow a visit, stat. The local spot has mastered the art of delicious fare between bread — and the menu is always changing, so there’s something new to try at nearly every visit. There are a few delicious menu staples, such as the Chief Beef and Grick Middle, but I’m always most intrigued by the specials. Farrow generally has two rotating options on the menu at all times, almost always with cheeky names that catch your eye. If you’re looking for plant-based indulgence, the vegan options won’t disappoint. Rather than your standard vegetable-packed sandwiches, Farrow loads its vegan offerings with inventive ingredients like scrambled chipotle tofu, housemade vegan ricotta and vegan queso. 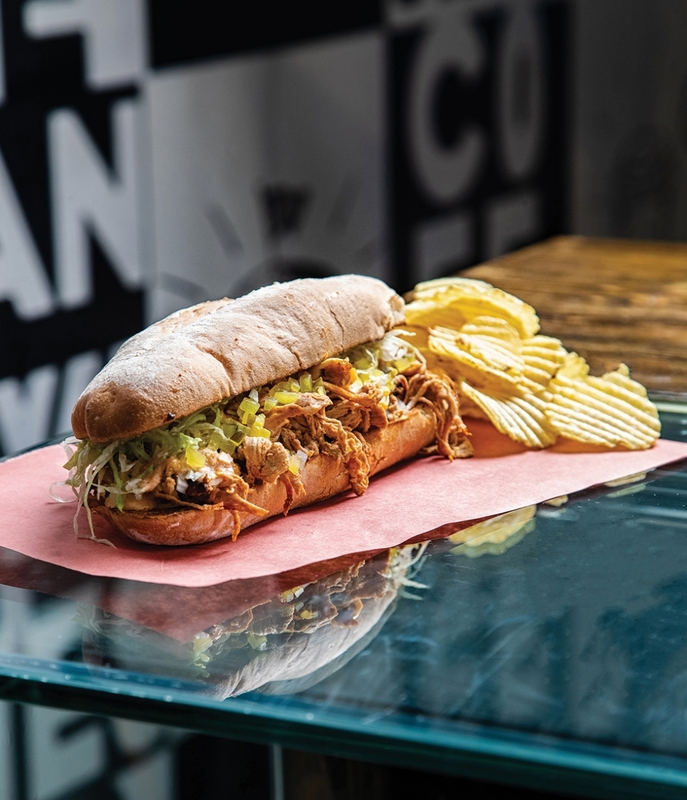 And, the carnivorous options are usually over the top in the best possible way — who could ever forget the Stonair, a one day special in honour of legalization that involved two waffle “buns” packed with donair meat, Doritos and much more? Word to the wise, though — the sandwiches are more than generous, so you may want to split one with a friend rather than trying to tackle it solo. – A.M.
For those looking for a quick lunch or to take home something substantial, Mercato’s in-store cafe has a variety of sandwiches that dare you to finish the whole thing in one go. Sandwiches come either on long crusty buns or thick focaccia — and the freshness of the baked goods is what makes them sing. Filled with cold cuts, cheese and peppery ajvar, these sandwiches aren’t about nouveau-gourmet fillings. They’re about the basics, done right. – S.S.
Meuwly’s is, first and foremost, a modern meat marketplace. Tucked in along 124th Street, the space doubles as an artisanal butchery and retail shop, with well-lit tables and staff smiles. It’s known for its house-made sausages, pickles and preserves, which you may have sampled at restaurants around town, but it also has a soup-and-sandwich lunch special, served daily from 11 a.m. to 2 p.m. You can’t go wrong with the perfectly pressed turkey panini with cranberry honey cider mustard, especially if you dip it in the savoury soup of the week. It’s just the right amount of bread and fillings, so you can still have a productive afternoon. – C.S.